Christmas holidays are over! It is the start of the year again and all business owners are responsible to file their government permits and taxes for the continuance of their businesses. 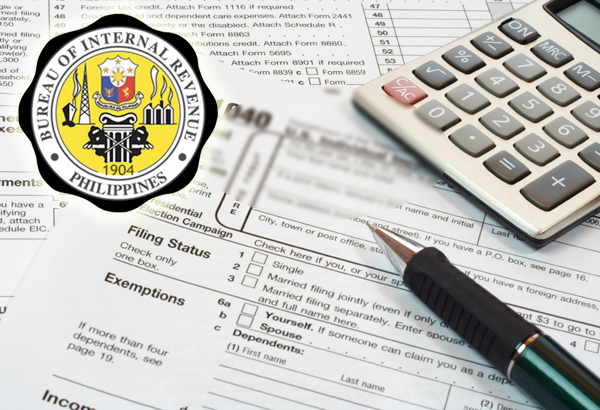 One of the most important things that every business owner should do is filing their corresponding taxes in the Bureau of Internal Revenue (BIR). This government agency is very strict in implementing tax collection. Every year, they conduct audits in every store to check if a business is paying their taxes correctly and timely. This is what they called Tax Mapping. They wouldn’t tell you when they would check on your business so it would be better to prepare for it to avoid huge penalties. Since tax mapping entails big fines and penalties for those who didn’t follow the BIR tax guidelines, the big question now, especially for new business owners is how can you avoid penalties during the tax mapping of the BIR auditor? So, here are 10 tips for you to have a hassle and stress free BIR tax mapping. 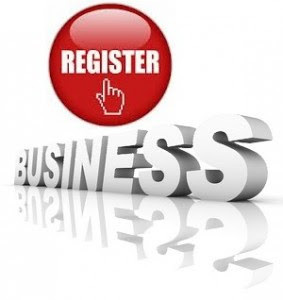 Before starting your business operation, always keep in mind to register your business first at the BIR office. 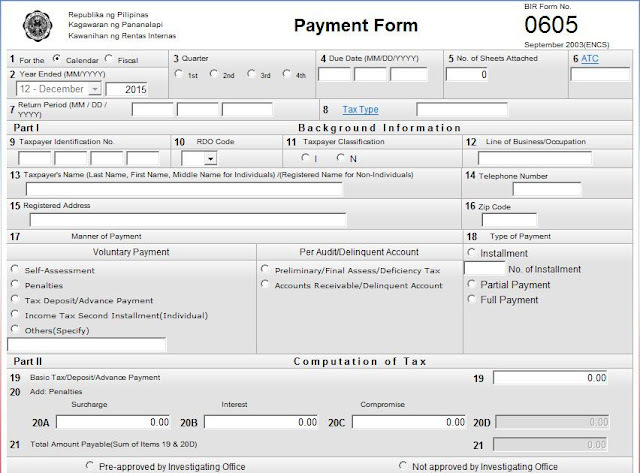 During tax mapping, they will check if you have documents which prove that your business is registered in their system. 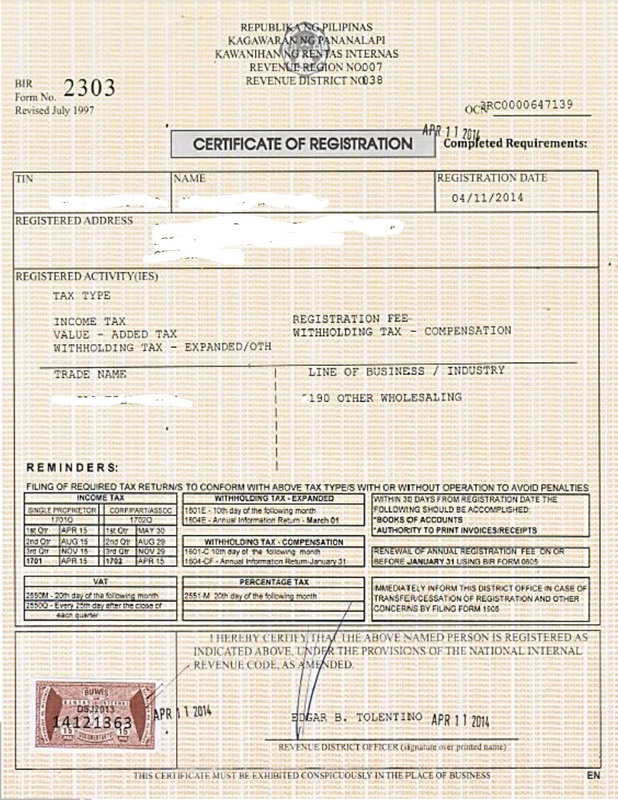 If you register your business as stated above, you need to display your Certificate of Registration as well to show that your business indeed is duly registered to operate. This is one of the checklist of the BIR auditor as they conduct tax mapping. You can put this document where everyone can see to avoid penalties. This document is needed to be filed and paid every year in January. It is better if you put this form in a plastic transparent holder and display it in your business location where people can see it. Failure to pay or even display this form could mean a fine of not more than P 1,000 or even an imprisonment of not more than 6 months (Sec 275, NIRC). The Bureau of Internal Revenue will give you a white and red poster with a big “Ask for BIR receipt” written on it. This should be seen by everyone so you will not be penalized for it. 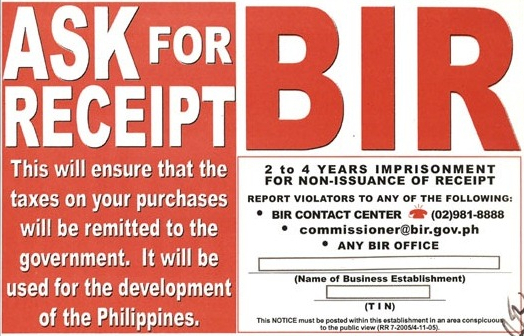 The BIR tax auditor will check if your customers and clients can see this poster. Failure to do so will also be fined, with not more than P1,000 or imprisonment of not longer than 6 months. 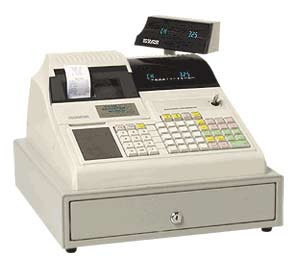 For businesses that use machines for payment purposes like grocery stores which have cash registers, always put the authorization stickers from BIR for the use of Point Of Sale/Cash Register Machine/CAS. Please take note that you need to register these machines individually and put the sticker in every machine to avoid huge penalties during tax mapping. 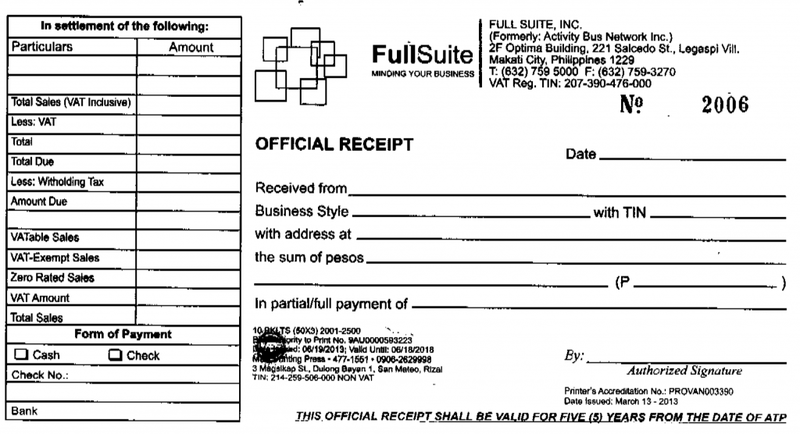 Every business should have a BIR registered official receipt. You need to issue this during the course of your business operation. 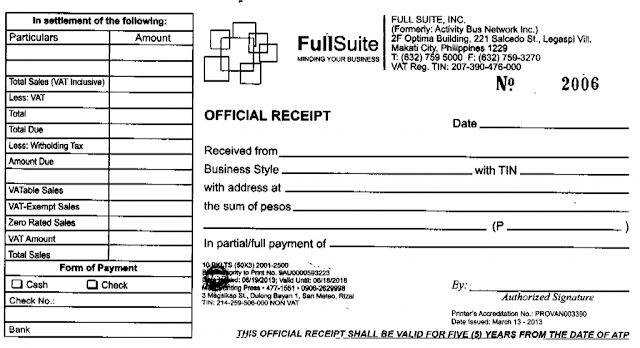 The BIR tax auditor always checks if you have a BIR registered Official receipt or Cash invoices for some business. Then they would check if you issue receipts on time. In my case, since I have a small canteen, we conduct business every weekday where there are classes in school; so I need to issue official receipts for transactions that are P25 and up transactions to avoid penalties. When a person asks or demands for an official receipt or cash invoices, you need to give it to them with the correct date, name and amount. Some business owners tend to lower down their taxes and put amounts that are not the one paid by the customers. Avoid these instances because you will face a huge amount of fine if proven guilty. The penalty for this violation is a fine of not less than P1,000 but not more than P50,000. Since this is a criminal offense, you might be imprisoned for not less than 2 years but not more than 4 years according to BIR penalty guidelines. Every business transaction issued by an official receipt or cash invoices should be recorded in the book of accounts. So every official receipt or invoices in the everyday transactions of the business should be updated also in the book of accounts. Many business owners that I know are always penalized in this area. They issue official receipts but tend to forget to record the transaction in their book of accounts at the end of the day. 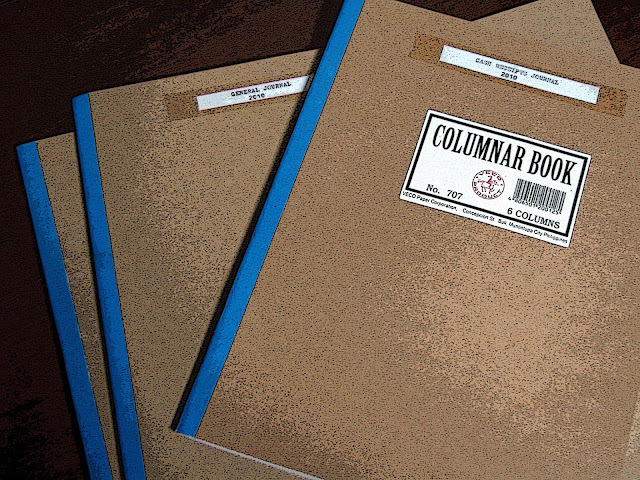 The BIR auditor always checks the entry of your official receipts or cash invoices issued in your book of accounts. If it will not tally, you will be penalized for this as well. If your business is paying Withholding taxes, you need to have the form ready since the BIR auditor also asks for it during tax mapping. In my case, every tax mapping that I experienced since I opened my business, the auditor asks for the copy of my Withholding tax form payment. So you need to pay your withholding tax on time and correctly to avoid further problem. To avoid big penalties and fines, you need to pay all your taxes that are required in your businesses on time to avoid surcharges and penalties. This would make you breathe easier in case you will be tax mapped anytime soon. So these are 10 tips to avoid penalties during the BIR tax mapping. Always bear in mind to be prepared in case you will be tax mapped anytime this year. Hello, I just want to ask a question. In our province, before the BIR was implementing that the taxpayer is not required to include withholding tax - compensation if the employees are not more than 10. 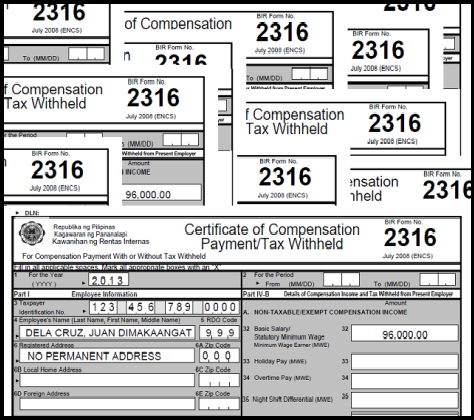 But as of now, when I am processing the updates of my COR, they want to add the withholding tax compensation in my COR. Do you have any RR or RMC that will prove that businesses with more than 10 employees are the only ones to have a withholding tax - compensation?